Chilliwack Healthcare services. Find a Health Professionals listings like Chilliwack dentists, Chilliwack personal trainers, Chilliwack pharmacies, and other health professionals in Chilliwack in British Columbia? 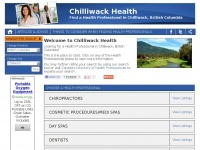 A profile of Chilliwack-health.ca was found on the social network Twitter. The web server with the IP-address 50.28.28.143 used by Chilliwack-health.ca is owned by SourceDNS and is located in Lansing, USA. There are many websites run by this web server. The operator uses this server for many hosting clients. In total there are at least 451 websites on this server. The language of these websites is mostly english.